Liked the look of him so decided to actually do one of these Futmas SBCs. Modest cost tbh. Just got him for under 50k, quite happy with that. How much did you drop on the SBC? How does @Carswell not get this card? About 50Ks worth of stuff. Used Mov Gustavo and Bellarabi which I had already. Draxler, Howedes, Toprak, Brahimi LW, Carvalho LCM, Gomez ST and Sommer GK, can't remember LB RB. Most of it was in my club, I've got like 700 players, I did buy Toprak, Howedes and Sommer for about 1.5k each. Swapped Son for Nolito, couldn't be bothered updating the pic. You know you could have used silver Movember cards aswell right? Yep. I never used Bellarabi or Gustavo anyway and their rating was easy enough to get the squad up. Cost about 50k which isn't bad. Don't use a La Liga or spanish side but might do at some stage. What did you fellas do to get him mind sharing your squads? Under 30k for me Had all in club, used a 59 movember and a 73 silver IF with 9x84 golds. Don´t even need an 85. Several Combinations of 80-84 works. Loved this one lol....spent like 10k coins, had all the perfect untradeables. 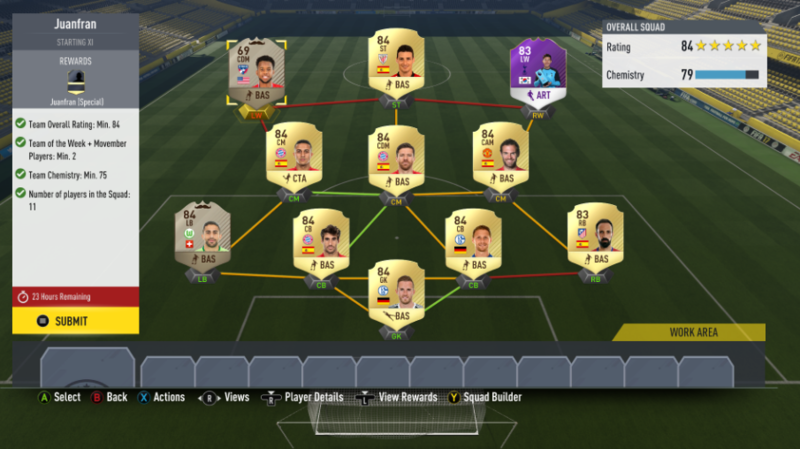 What is the cheapest way to get juanfran? And does he cost like 50-80k? No, turns out I overpaid quite a bit at 50k. Use futbin sbc and it gives you combinations. I don't get how the squad rating works but you can use a 59 rated movember card (8k) and a silver movember card (14k) and the rest are 84's. Really cheap in the bundes or liga nos. How can you tell a TOTW player? If you have a 67 and a 69 movember you can do 7x84 and 2x83 for the regular players. Look to Bundesliga or a mix of Bundes and Liga Nos for chem. Maybe get the Movember from the same league or same nation. Or do loyalty quitting 10 TOTW games. Can even use bronze. I used a 73 and a 59 and 9x 84 golds. Bundesliga has a shitton of 84s and they are pretty much all available well under 2k. f.e. you could put in 1 random 71 and 1x72 but also 2 dozen other combinations.